Whether hitting the open ocean, boarding on the lake or heading to Havasu for party, never stop the music! 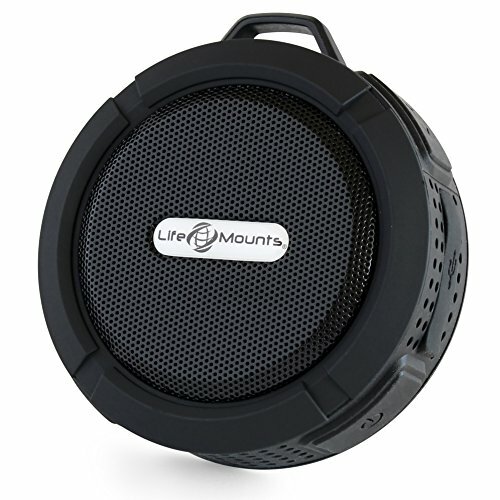 The Life Mounts Bluetooth Boat Speaker System is a must-have accessory for every boat. It features a powerful 5 Watt speaker that plays all your favorite tunes with crystal clear sound. The built-in microphone allows you to easily answer phone calls while on the go without missing a beat. The rechargeable battery provides hours of continuous use and weeks of stand-by time meaning it will be ready to go whenever you are. Your boat speaker comes with Life Mounts patented silicone rubber mount that adapts to a variety of mounting locations. The speaker is easily removed from the mount if needed and can be used in the shower or hung from your bag using the included suction cup and carabineer accessories. The possibilities are endless! Life Mounts stands behind all of our products with no-hassle returns and exceptional customer service. So turn up the music and hit the water with the Life Mounts Boat Speaker. If you have any questions about this product by Life Mounts, contact us by completing and submitting the form below. If you are looking for a specif part number, please include it with your message.